Get ready to walk and dance your way through one of the most enjoyable fundraising events of the year! 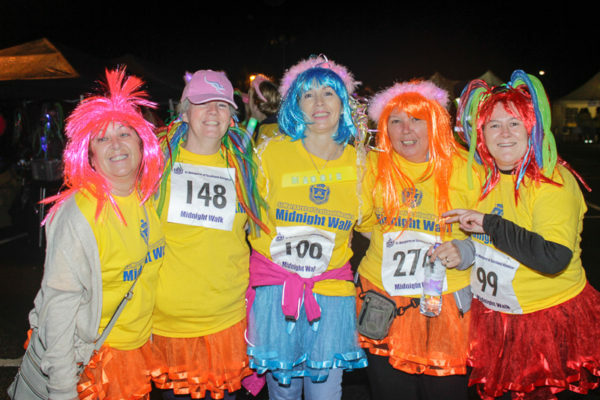 The St Margaret of Scotland Hospice Midnight Walk 2017, generously supported by KFC, Aggreko and Sainsbury’s, is Open to All – and we are certain this year’s event will be our biggest and most colourful so far. To get our walkers into the party mood, we’re staging a WORLD RECORD Slosh attempt – led by our host for the night, DJ Steve McKenna. Last year, more than 400 walkers took part, raising tens of thousands of pounds in vital funds for the care of Hospice patients. Participants will set off from Great Western Retail Park before navigating the traditional route along Great Western Road and returning from the Kilbowie roundabout. Bright costumes and glow-in-the-dark headgear are not only welcome, they are actively encouraged! The event begins at 9.45pm with a registration process, followed by live music with Steve, our world record Slosh attempt and a keep-fit session before the walk itself begins at midnight. After completing their task, the walkers will enjoy a presentation ceremony and barbecue at 1am, before time is called on what promises to be a wonderful night out at 2am. Formerly a Ladies-only event, the Midnight Walk is now Open to All. Participants MUST register beforehand to take part. Children aged 6-16 may enter if accompanied by a responsible adult, and we ask that no more than two children accompany any individual adult walker. The deadline for registration is 5pm on Friday, 1 September. Each adult is asked to raise £30 in sponsorship – which can be collected through the Hospice Just Giving page www.justgiving.com/smh if preferred.